bl.uk > Online Gallery Home	> Online exhibitions	> Asia, Pacific and Africa Collections	> An idol shop. This photograph was taken in the 1890s as part of an album entitled 'Portraits of Bengal types, trades and castes'. 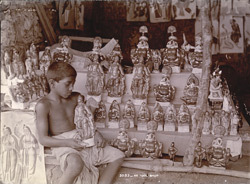 It is a view of a shop selling statuettes of Hindu deities arranged on shelves with a boy seated in the foreground holding a statue. Such brightly painted deity images would have been used for private devotion and prayer. The photographer is unknown but it was possibly by Bourne & Shepherd and is one of a series of portraits of ethnic groups and individuals from across India.